These no bake tahini fig bars are chewy, nutty (without any nuts) and loaded with powerhouse ingredients. Make a batch on the weekend and have a delicious, healthy snack all week long. Nut free and dairy-free. I think I’m most successful with my health goals when I have food prepped and ready for the week. Even as a health coach, it can be difficult to resist temptations when I don’t have healthy options on hand. I tend to reach for easy, convenience foods that don’t make me feel as well. But lately I’ve been really good with my batch cooking on Sundays, which is my favorite way to meal prep. I prep a bunch of different items — like grilled chicken, a quinoa salad and some roasted veggies — so when it comes time to eat, I can throw together all the components and make a quick salad or bowl. Healthy eating is really that simple! When it comes to snacks, I have become hooked on fresh veggies (like carrot chips, mini bell peppers, cucumbers, cherry tomatoes and celery) with dip (usually hummus or Bolthouse Farm’s cilantro avocado dressing). It’s amazing how satisfying crunchy veggies with dip can be. I typically chop some of the veggies in advance and place them front and center at eye level in the fridge so when I open it up, it’s the first thing I see and grab. This little trick works like a charm for healthy snacking. However, I’ll admit sometimes I’m craving something a little more substantial and errr… chocolatey. 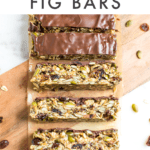 So recently I created these tahini fig bars, which are basically like the fruit and nut granola bars you’d find at the store, but homemade (no yucky additives!) and filled with fig tahini goodness. They are the perfect bar to prep on the weekend and have all week long. Plus, they’re no bake and can be whipped up in no time. 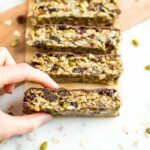 Old fashioned rolled oats – Rolled oats are my oat of choice for these bars because they absorb a good amount of liquid and hold their shape during the mixing process. All oats are naturally gluten-free, but they are also one of the top foods that are contaminated in processing, so look for designated gluten-free oats if needed. I usually buy the Bob’s Red Mill gluten-free rolled oats. Dried figs – You can find dried figs in most major grocery stores (even Target and Costco). If you can’t find them at your usual store, look for them at a natural foods store. Tip: they are typically found by the dried fruit. Figs are high in fiber and packed with powerhouse antioxidants, vitamins and minerals. Pepitas – Also known as pumpkin seeds, pepitas are a great source of healthy fats and protein. Again, these should be at most major grocery stores in the seed and nut aisle or in the bulk bins, but if you have trouble, head to your local health foods store! 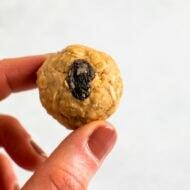 Tahini – If you saw my tahini recipe post, you’ll know that I’m in love with tahini and I love making recipes with it — everything from this garlicky kale salad to these chocolate chip tahini cookies. My favorite tahini is the organic Whole Foods brand, but I also regularly buy the Trader Joe’s brand tahini. Tahini is rich, creamy and nutty while also being a great source of iron, calcium, fiber as well as healthy fats and amino acids. 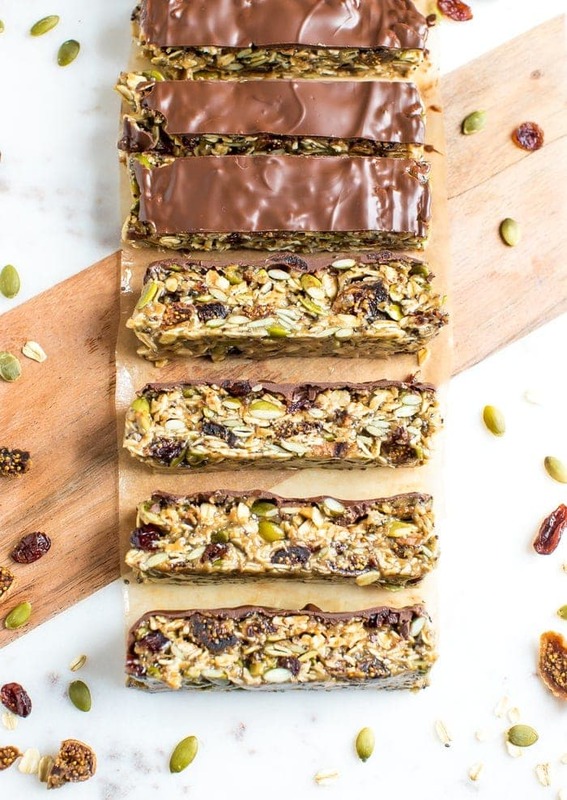 It also makes these bars nut-free so they’re school-friendly! Honey – I love honey and think the flavor works wonderfully in these bars! Look for local, organic honey if you can. Did you know that eating local honey could help with seasonal allergies? Worth trying out! Flaxseed – Flaxseed has a ton of health benefits — like healthy fats and fiber — which are both imperative to the standard American diet. Use ground flaxseeds (or grind them before using) to help make them easier to digest. Chia seeds – Chia seeds are another powerhouse seed! They have a ton of nutrients but not a lot of calories, which is what the health world calls “nutrient dense”. 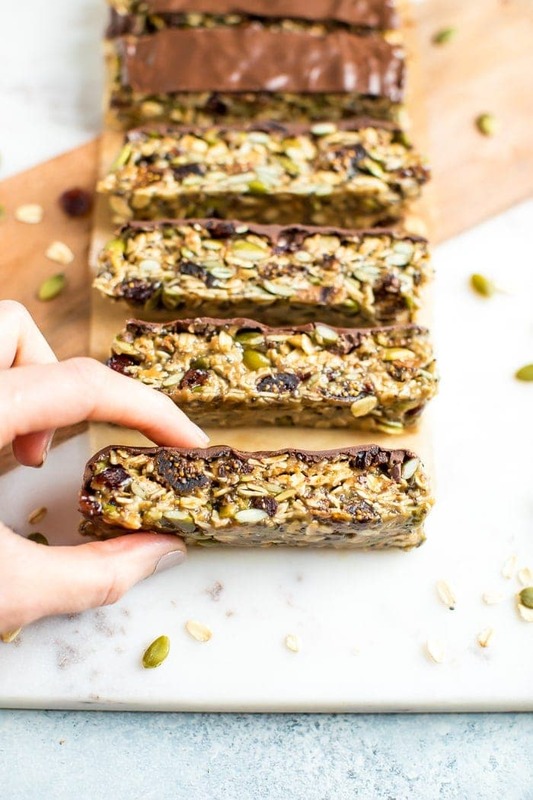 Chia seeds absorb liquid and gel up which helps hold these bars together! If you make these tahini fig bars be sure to let me know how they turn out by leaving a comment and star rating below. Your feedback helps me create the best heatlthy recipes for you and helps other EBF readers who are planning to try the recipe. 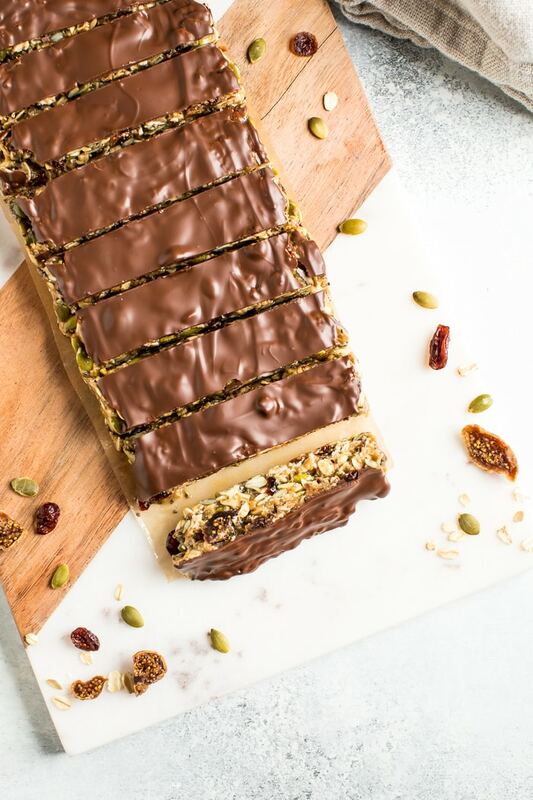 These no bake tahini fig bars are chewy, nutty (without any nuts) and loaded with powerhouse ingredients. 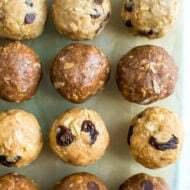 Make a batch on the weekend and have a delicious, healthy snack all week long. Nut and dairy-free. Line a loaf pan with parchment paper. Add oats, figs, pepitas, tahini, honey, ground flaxseed, chia seeds, vanilla, cinnamon and sea salt in a large bowl. Once the mixture is holding together, transfer into the loaf pan lined with parchment. Fold the parchment over top and press the mixture firmly and evenly into the pan. Place in fridge for a few minutes while melting the chocolate. 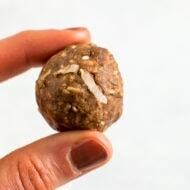 Add chocolate chips and coconut oil to a microwave safe bowl and heat in 30-second intervals until melted. Pour melted chocolate over the bars and spread using the back of a spoon. Place the bars back in the fridge to harden (about 30 minutes). Remove from the pan and cut into 8 bars. Store bars in fridge for up to 1 week. Enjoy cold or at room temperature (I’ve found that they hold together best when chilled and they taste delicious straight from the fridge). Friend! These look amazing! Can’t wait to try. Have you tried freezing this recipe? I’d love to have something like this to grab and go, but I wonder if the freezer would run the texture? Do you think you could replace the oats with buckwheat? I was drooling over this so started making them only to find no figs. None! Enter medjool dates. They turned out quite delicious! So glad I read this comment, because I was just thinking “I have dates at home wonder if that will work?” Question answered! So excited to try these out! Are the pepitas shelled or with shell on? Would love to make these, so trying to clarify. OH MY GOODNESS! Thank you for the clarification re pepitas, Brittany. Made them and they are delicious! Pulsed my figs in the food processor, because I had whole figs; then added all the rest and pulsed a few more times. Easy peasy! I made this recipe this week. These are soo delicious and satisfying, and I didn’t even make the chocolate topping. I used dates instead of figs because that’s what I had. Thank you!!! This is one fantastic recipe! I made it with dates since that’s what I had on hand. The bars freeze well – I froze some for a later time. You are an amazing cook. I would never have thought to use tahini this way. I used dates because I didn’t have figs and also threw in some sunflower seeds to use them up. One of the best homemade snacks I’ve ever made. Insanely delicious.